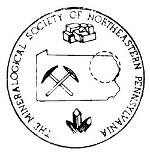 The Mineralogical Society of Northeastern Pennsylvania (MSNEPA) is 40 years old. MSNEPA, started by an avid group of Rockhounds, held our Charter Meeting on November 25, 1973. Our Society is a non-profit educational organization. Our goal is to promote the study & appreciation of the Earth Sciences & Lapidary Arts. Members range in age from youngsters to senior citizens & encompass all levels of expertise in a multitude of diverse disciplines. Our Meetings are held in the basement of the Moosic Presbyterian Church, 625 Main St., Moosic, PA., the 4th Sunday of the months of September through May. The Board Meeting is 1pm & the General Meeting is 2 pm. Next Meeting: April 28th, 2019. 16th Annual Gem & Mineral Show, at the Oblates of St. Joseph, 1880 Hwy 315, Yatesville, PA (just outside of Pittston, PA). 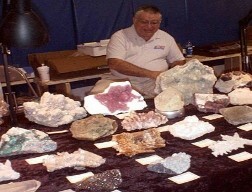 Our Links page has some interesting websites to check out for more information on Gem & Mineral Clubs & Shows in your area. We also have a link where you can get detailed information on specific Gems & Minerals. If you are looking for finished Jewelry & other Handcrafts...check out our Links page!